players and it was a tight close game which suits his style. 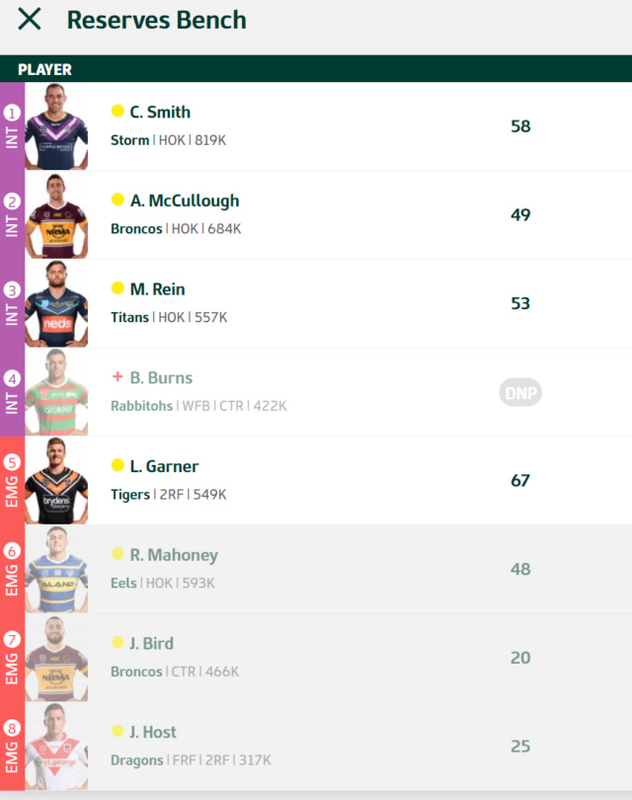 I’d be going AFB he is looking good and like a Hasler fav, his TBs have been his only real attacking stats most of his points have been from RM and Tackles. Yes would have a lower floor but his ceiling is so much higher then Tolmans. You know what Shanbon, went back and looked at Paulo and I think he will do the job nicely. Krump mentioned him a couple weeks ago as well and he is still going great guns. He was one of their big off season signings, has a big motor and can punch out a big score on his day with good attacking stats. Even if he gets me 40points minimum for the next 6 weeks (while I jump on all the fallen guns), then he has done his job. He has shown he can score very well, and he hasn't even scored a try yet in a Raiders team getting better each week. Long wait to see how those trades work out, last game of the weekend. I like your approach this year Booze, I scored 964 with a "cookie cutter" team. Your high scoring hookers seem to balance out the light WFB and still get you a top score. @Chewie wrote: I like your approach this year Booze, I scored 964 with a "cookie cutter" team. Your high scoring hookers seem to balance out the light WFB and still get you a top score. Thanks mate, nice score yourself. Alot of our teams are merging to the same point, just been a different journey to get here haha. Goal kicking helps give him a stable base, back to WFB where he will go back to killing it. Well after to a solid start to his career he seems to be in favour as the Warriors young half. Not sure why you would be targeting mid rangers like Sutton. You already have 1 too many, not being able to play Mahoney last week. Surely the surplus of Hookers should be the key target to trade some in to cash up to some keepers that you can play instead? Key weaknesses are halves and WFB to use that cash on by ditching McCullough and playing Mahoney instead for similar scores. @mattnz wrote: Not sure why you would be targeting mid rangers like Sutton. You already have 1 too many, not being able to play Mahoney last week. Surely the surplus of Hookers should be the key target to trade some in to cash up to some keepers that you can play instead? Key weaknesses are halves and WFB to use that cash on by ditching McCullough and playing Mahoney instead for similar scores. Have been doing some thinking over the past day about my team setup and what risks I want to take. I see where you are coming from and the plan originally was to bring in x2 WFB this week. Have been chopping and changing on 2 guns in vs 1 cow/1 gun but think will lean towards the latter to give me more flexibility and depth for this week at least. It will be only for this week with the extra cover in the 14-17, just want the extra coin in the bank and some flexibility next week on trades which this gives me. 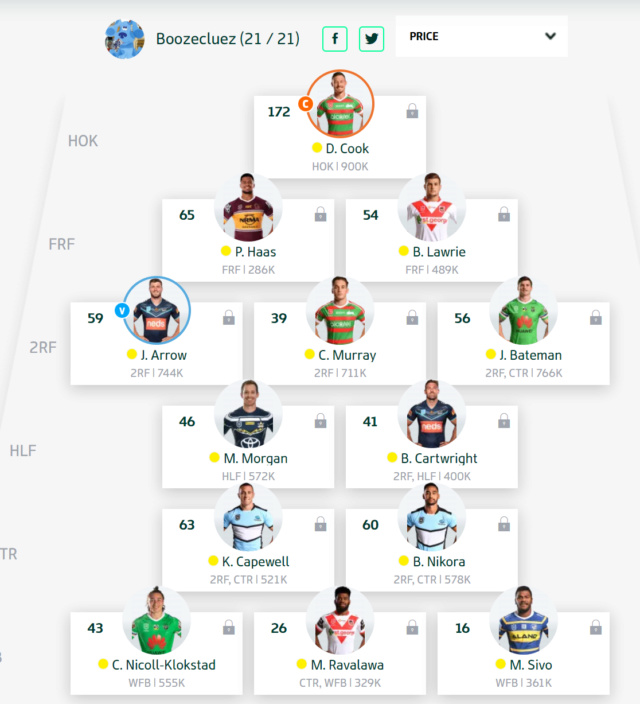 McCullough is an easy swap next week to a Tedesco regardless if I go that route now, being able to cash out a couple cows this week is good too. Ogden and Sutton are really just some options that I had considered, Sutton the past 2 weeks so just watching really. It really comes down to the DPP updates next week but ultimately I am flexible and will be after a FRF/2RF player soon for cover regardless. Nice trades, great team, ready to do some damage.